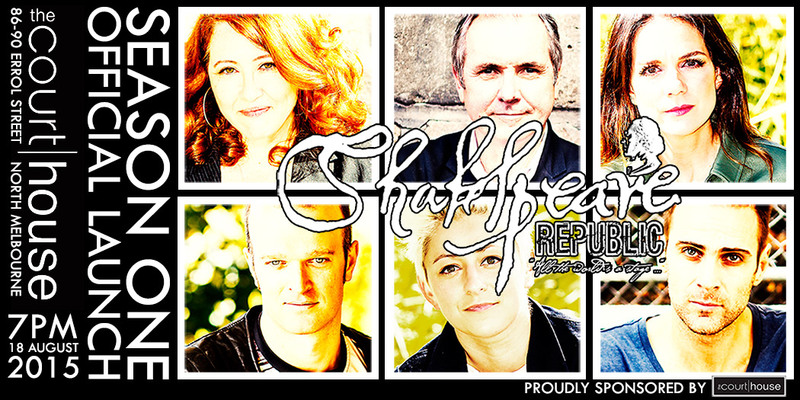 Shakespeare Republic Launch Party Announcement! The Republic is delighted to announce that bookings for our Official Season One Launch are now open! While we are still busily filming and editing, there is nothing like a deadline to keep one (or a team) focused and so it is with great pleasure that we can announce the date of our Launch Party! We are also thrilled to announce that our Official Launch Party is being sponsored by the wonderful folk at The Courthouse Hotel. Established in 1862, The Courthouse Hotel is open every Tuesday to Sunday from 11.30am to late and offers a wide range of beverages as well as a fantastic line up of pub food and a top-rate gluten free menu, which can be enjoyed in their lounge bar or chic cafe/restaurant space. But The Courthouse is not just a place to enjoy great food and a comfy spot at the bar. Winner of the Melbourne Fringe Festival Best Venue award in 2014, proprietors Jason and Julie also provide a haven for the Arts Community of North Melbourne and beyond, with several unique performance spaces available and a very Arts friendly attitude. Come and join us for free glass of bubbly and some banter from the Bard, as well as a first look at Alan Fletcher with his modern day but equally murderous Macbeth, followed by a sneak peek of the entire series. Posted On 03/08/2015 in Project Updates with 0 Comments.Tagged: launch, screening. ← Ben Steel in shirt and tie with a webcam … Day 4 is complete!